Be the first to share your favorite memory, photo or story of Harrietta. This memorial page is dedicated for family, friends and future generations to celebrate the life of their loved one. Mrs. Harrietta Walters Lucas, age 62, of Garrison, Kentucky, passed away Monday afternoon, October 22, 2018, at her residence surrounded by her loving family after a long courageous battle with cancer. She was born June 6, 1956, in Portsmouth, Ohio, a daughter of the late Harry and Wanda Christy Walters. Harrietta attended the Bivens Chapel Church and she enjoyed going to church, sewing, cooking, and spending time with her family and friends, especially with her grandchildren. In addition to her parents, she was preceded in death by one daughter, Shauna Renea Lucas. 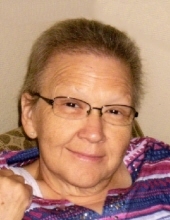 Harrietta is survived by her husband of 44 years, Andy Lucas; one daughter, Andrea Carmon of Tollesboro, Kentucky; three grandchildren, Shauna Mustard, Breanna Stevenson, and Brantlee Carmon; one great grandchild, Kobey Moore; one brother and sister-in-law, Dave and Jennifer Walters of McDermott, Ohio; and three sisters and brothers-in-law, Brenda and Glen Lawhun of South Portsmouth, Kentucky, Darlene and Wayne Wright of Quincy, Kentucky, and Patty and Dennis Parson of Portsmouth, Ohio. She also leaves many other family members and friends who will sadly miss her. Funeral services will be held at 11 a.m. Friday, October 26, 2018, at Globe Family Funeral Chapel in Garrison, Kentucky, with Brother Ronnie Conley officiating. Burial will follow in the Crystal Dawn Cemetery in Lewis County, Kentucky. Friends may visit from 9:30 a.m. to 11 a.m. Friday, October 26, 2018, at Globe Family Funeral Chapel, 103 Dudley Avenue, Garrison, Kentucky 41141. Jason Stout, Eric Cochran, Kirkland Cochran, Chris Keeton, Mike Diller, Harry Walters and Rusty Dunigan will serve as pallbearers. "Email Address" would like to share the life celebration of Harrietta Walters Lucas. Click on the "link" to go to share a favorite memory or leave a condolence message for the family.